So the sooner you start gentle strengthening exercises and treatment, the better your chances of reducing pain and improving your function. Now whilst we can’t change the laxity that is occurring within the pelvic ligaments, we can compensate for this by strengthening the supporting pelvic muscles. So should I just put up with it? Or can I actually do something about it? You can definitely do something to help this! 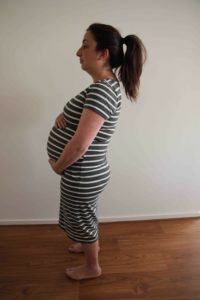 So many pregnant women think that they have to put up with this because it’s to be expected during pregnancy… no! Whilst it may be common, that doesn’t mean it can’t be treated. Besides, if you had a choice, I don’t know a woman that wouldn’t want to rid herself of pain. 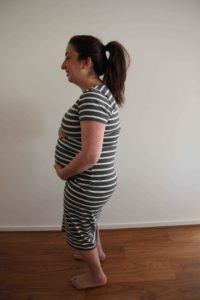 Let’s work together to keep you mobile and strong in your third trimester and then give you the energy, strength and mobility to power on through labour and birth! Standing on one leg ie. when getting dressed. 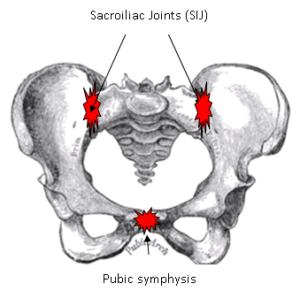 Placing asymmetrical pressure on the pelvis can aggravate and inflame the pelvic joints due to the uneven loading. Moving the knees apart can place more pressure on the pelvic joints as they stretch. Instead try to imagine you are always wearing a “mini skirt” and keep your knees together, particularly when getting out of bed or out of the car. Crossing your legs when sitting, as this can cause uneven rotation on the pelvis which will make it even grumpier. Heavy lifting. The pelvis is already suffering under the pressure of a baby in a big uterus… it doesn’t need anything extra putting strain on it’s already inflamed joints. Ask for help from family and friends to lift heavy items if necessary. Exercises that place too much pressure on the pelvis such as star jumps, running, single leg exercises, deep squats or skipping. Strengthening your pelvic muscles, as mentioned above, specifically your gluteals, pelvic floor and deep abdominals. Water exercise. Gentle walking or light exercise in the water will help to offload the weight on the pelvis (and make you feel a little less pregnant!). Try to avoid kicking your legs as this can aggravate your pelvic pain. However using a buoy between your ankles and only swimming with your arms is nice. It is safe for pregnant women to exercise gently in water up to 32 degrees celsius. Make sure to always have a drink bottle nearby to stay hydrated. Your best bet is to find a local pregnancy water class run by a physiotherapist. 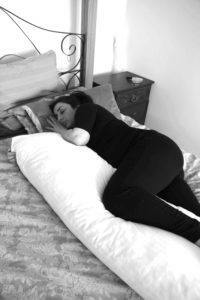 Sleeping with a pillow in between your legs at night time will help to reduce your pain. This will help to make sure that your pelvis doesn’t rotate inwards too much. By placing a pillow in between the knees you keep the hips at the right height and reduce strain on the pelvis and gluteal muscles. Practice good posture. Be aware of how swayed your lower back may be and try to gently tuck your pelvis under. As the weight of your tummy increases, women will find themselves with a large curve in their lower back to compensate for the change in posture. Or they may find themselves leaning back slightly to compensate. This can place unnecessary pressure on the pelvis. Keep your knees together when getting in/out of bed or the car. Sit down to get dressed, to avoid standing on one leg. Too much lower back sway! An ice or heat-pack. In my clinical experience, ice over the pubic bone and heat over the gluteals tends to work best for relieving pelvic and back pain. Ice for 10-15 minutes, every 2-3 hours… make sure to wrap the icepack in a small towel and don’t place directly onto skin. Use the heat-pack for 10-15 minutes, as often as you like but make sure it is comfortable on your skin and not too hot. Compression shorts or a pelvic belt to provide extra pelvic support. This can help to manually support the pelvis if the muscles are too weak to do so. However don’t be fooled… it won’t solve all your problems.. you still need to exercise those muscles! You can get these products from your local physiotherapist, doctor or chemist. Best to be fitted by a health care professional to ensure the sizing is correct.